I realized today that after finally updating Siori’s outfit, I never shared it. In making it, I actually started with the White Mask and the chestpiece and went from there. It definitely feels like a Night Elf Rogue, and more importantly it feels like “Siori.” Aside from perhaps a contest, this will probably now remain her go to outfit…though I’d like to get her the Fangs of the Father as the final piece(s). As usual, the full contents of her outfit can be found on her page. Not to be outdone on my own server (Runetotem-US), I found a great looking Death Knight just inside the Trade District Auction House last weekend. Decimation was working a great blue theme that really impressed me. Sure, he had taken four components of the Sanctified Scourgelord set (shoulders, chest, legs, hands), but he complimented it incredibly well. Going the extra mile to make the tabard suit the outfit is always something I appreciate (when it works, rather than as an excuse), and the Tabard of the Lightbringer is a perfect fit. Very well done and definitely feels “DK.” As of this writing he’s sporting a purple theme that’s also well done. You can see it at his armory page. Sorry, no Rocky. Instead, I finally had a chance to show Effy how it’s done, after she laid a challenge at my feet last week. You can see her own response to the challenge here. 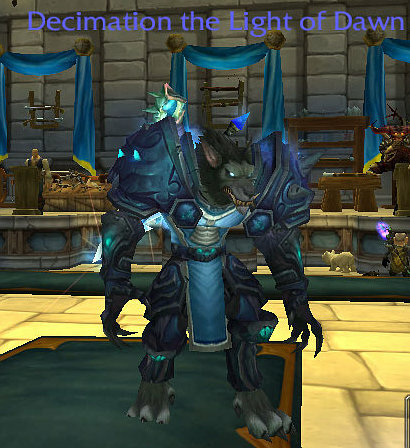 With everything going on I made it clear I wouldn’t have a chance to present my proper Gilnean until today. Even following the War, and the infection…well, admit it, she still looks good. Just don’t get too close, those claws are sharp. When you play characters that can only die once, you tend to have some narrow escapes. Popping out of cat form to heal myself and pop back in is almost second nature to me. However, cat form isn’t much use in the taking back of Gilneas. Or so I thought. While I’m definitely disappointed to lose him, I take some comfort in the fact that I did far better than I had with Xelkirk. Level 12 isn’t ooh and ahh, but it’s better than 7. At least I got a spec and talent points. I move on to character number five in the project, and once again back to the Horde. 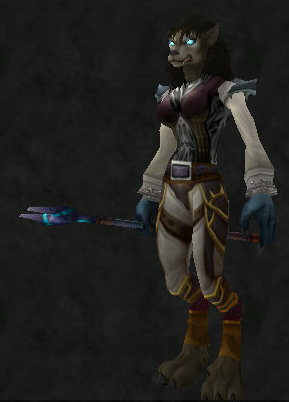 This time, I’ve rolled my first female toon. 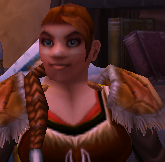 Meet Nasani, the Blood Elf Mage. I honestly can’t believe I hadn’t posted in over three weeks. That certainly wasn’t my intention upon announcing my return. 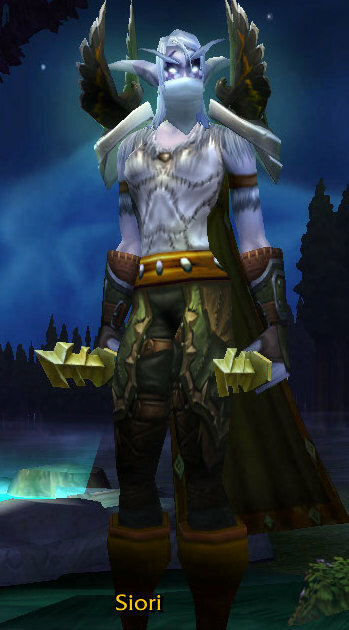 In truth, I’ve not played World of Warcraft as much as I might have liked. With a little one in the house, it gets harder to keep one eye on Azeroth and one on him. In the 26 days since you last heard from me, Egwydorian (pictured above) has gotten to level 25. I’ve discovered in the Wetlands the old raptor nest area is now an archaelogical site, complete with living fossils. A nice little change. I continue to adjust to playing an Elemental Shaman after having Carrera in the Restoration tree. Alas, she’s not seen any action in quite some time. My Warrior Levache remains at level 10. I finally got the urge to go crazy again with him, and discovered a giant wall where the road out of Thunder Bluff used to be. It’s little things like that I am enjoying again. Surprises, as it were. As well, Clawmantle is now level 8 and in Stormglen. 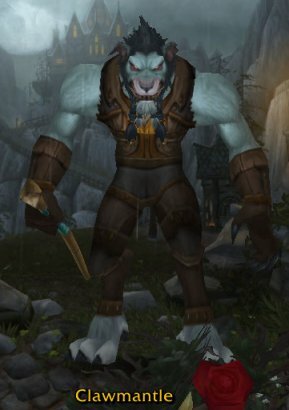 This will be the third Worgen I’ve run through the start zone, so I know it well and I have managed to avoid any real near death experiences. At least he has already passed Xelkrik’s point of expiration. 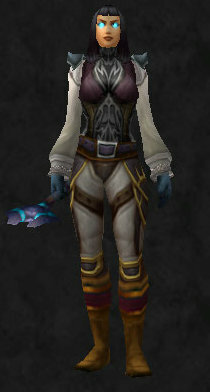 So yes, in the time I have I seem to be spending it puttering around on my lower level characters. I did, early in the month, burn through Uldum on Siori. I really enjoy that zone, and everything about it. I believe she has just a few quests left to knock off in it. She’s also getting close to 85 so the two might go hand in hand. 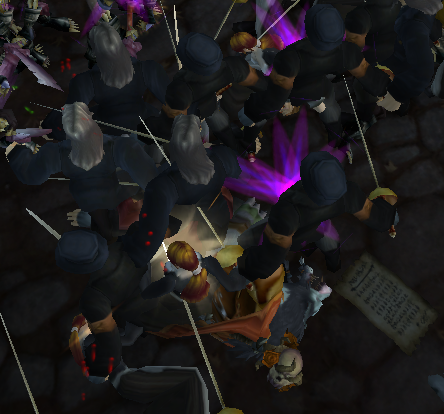 Today was supposed to be a comparison between the two newest racial start zones in the game, the Goblins and Worgen. 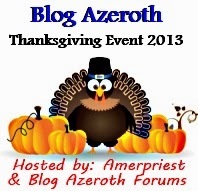 In order to meet that, I had to first finish the Goblin zone on Xelkrik. As you can see, that’s not going to happen today. 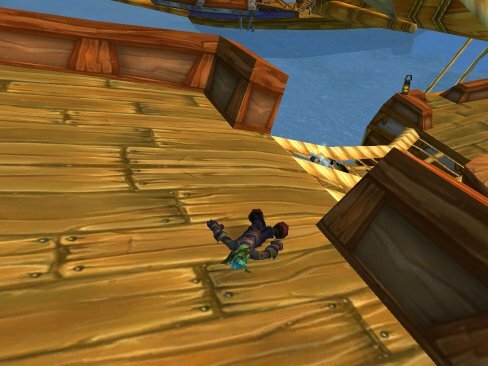 He’s dead now, courtesy of the sailors on the Vengeance Wake while trying to retrieve some Precious Cargo. So, character number two in my One Life To Live effort is also gone…even earlier than the first. In true goblin fashion, I blame my pet crab. He had a tendency to wander off while I would shoot something and thus create a scenario where I had to shoot many somethings. Which Race/Class Combo Are You Most Like In Real Life?